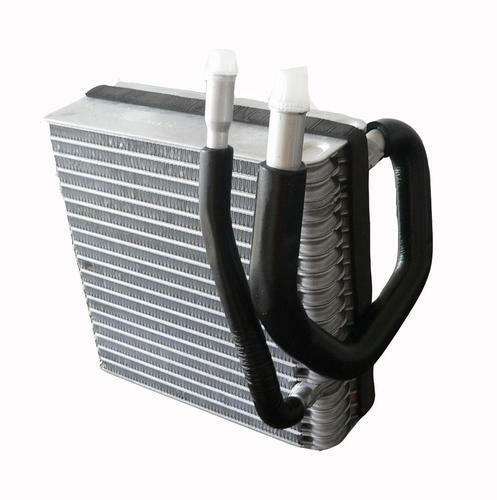 The evaporator is a long tube, or coil, that goes back and forth through a multitude of cooling fins. The refrigerant is a liquid when it enters the evaporator. A fan blows warm air over the evaporator and causes the liquid refrigerant to boil. After it has absorbed the heat from the warm air, the warm air isn't warm anymore. The same blower that blows the warm air (that is now "cool" air) over the evaporator keeps on blowing it into the interior of your car, and you have -- air conditioning! The evaporator also removes the moisture from the air coming through its fins and turns it into water. The water just drains off. The temperature of the evaporator coil can go from 33 degrees F to 0 degrees F. If it goes below 32 degrees F, the moisture that's supposed to drain off the coils will freeze. This makes for a very (surprise!) inefficient system, so a thermostatic switch is used to connect and disconnect it to the compressor as necessary. Established in the year 2009, Excellent Enterprises is considered as a united exporter and trader firm concentrating in superior quality Fan Clutch, Exhaust Manifold and Header, Oil Filler Cap, Transmission Gear and Windshield Washer. Our offered are well appreciated and demanded by our valued clients for their features like sturdy construction, corrosion immunity, wear and tear immunity, durable finishing and competitive costs. Our clients can avail the offered range from us at market leading rates.